2015 Acura ILX reviews agree this upscale compact sedan is handsome, economical and packed with enough technology and performance to convince many that authentic luxury can be affordable. Automotive journalists say the design of the ILX presents a more youthful take on a compact luxury car than competitors in the segment. Take a look at the inside of a 2015 Acura ILX in Peoria. The ILX dashboard uses a dual-cockpit design. With its elegantly layered textures and intuitive functionality, it is easy to see the ILX was designed to enhance the driving experience. The cabin is comfortable and spacious, even for back seat passengers. The fit and finish is excellent and quality materials throughout give this sedan a solid and premium feel. Quality construction and active noise cancellation combine to provide a blissfully quiet ride. The 2015 ILX is available with a 150-horsepower 2.0L four-cylinder engine with a five-speed automatic with paddle shifters, or a sportier 2.4-liter, 201-horsepower four-cylinder engine with a six-speed manual. Either version will deliver great fuel economy, fun driving dynamics and a comfortable ride. The generous list of ILX standard features includes a Bluetooth hands-free phone interface; power moonroof; keyless entry with push-button start; rear-view camera; a leather-wrapped steering wheel; leather upholstery; dual-zone automatic climate control; and a DC power outlet. 2015 Acura ILX reviews say this compact luxury auto is among the safest vehicles on the road today, and may well be one of the safest compact cars available at any price. The National Highway Traffic Safety Administration (NHTSA) has given the ILX a five-star overall score, and the Insurance Institute for Highway Safety (IIHS) awarded the ILX its top scores in all categories of testing. With all the Acura ILX has to offer, it is also surprisingly affordable. 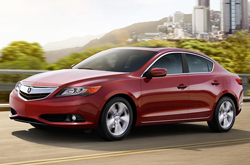 Test-drive a 2015 Acura ILX in Peoria at Acura of Peoria.